The ginger broth is really what makes the soup but the bok choy is always such a nice treat. 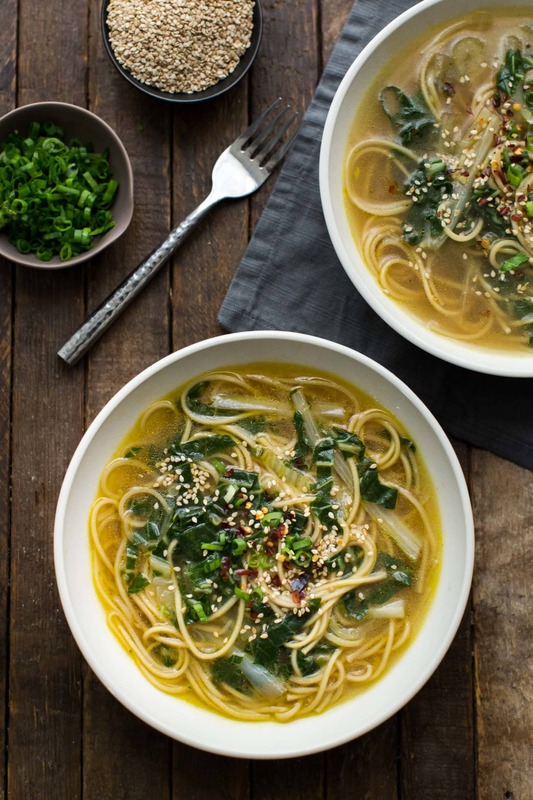 Also, this soup is great with any type of greens so if you’re unable to find bok choy, you can still make this oup! In a stock pot, heat olive oil over medium-low heat. Trim the ends off the scallions and chop up the light green stem. Save the dark green tops for topping. Next, add the scallions to the pot with the garlic and ginger. Cook, stirring occasionally for 2 to 3 minutes until the garlic and ginger is fragrant. Pour in the vegetable broth and water. Bring to a boil, reduce to a simmer, and cook for 5 minutes. While broth is simmering, cut the end off the head of bok choy. Cut off the stems and then cut the stems into thin strips. Roll the leaves together and also cut into strips. Add the stems to the broth and cook for 5 minutes or until stems are starting to be tender. Follow with the leaves and cook for another 5 minutes more. Finally, stir in the ramen and simmer soup until the noodles and bok choy are tender, 4 to 6 minutes. Taste and add salt as needed. Tips & Tricks: I’m not referring to instant top ramen noodles. Rather, I recommend ramen noodles such as my favorite dry ramen. Ramen is also available fresh or try your hand at making the noodles. 0 Response to "Ginger Bok Choy Soup with Noodles"